Listening to Unite’s joint leader Tony Woodley addressing the union’s first annual policy conference in Manchester this morning, you couldn’t help but be struck by how much he wanted to impress on delegates the right – and wrong – ways of leading a union. And he picked on one of his favourite words in trade unionism: organising. Woodley said: “Why should an employer listen to a union representing a minority of employees? Of course they won’t and they don’t. That’s why we need to push… for 100 per cent membership [in a given workplace]”. Most strikingly, he warned: “If this union ever, ever retreats from organising and it does go back into a comfort zone of sweetheart deals, managing decline, then this union will have wasted the vast potential that we’ve built in Unite.” Hardly comforting words. But decline is what Unite has to deal with: its membership has been falling for decades. Woodley’s words require no inference. He is clearly proud of the approach he has backed in the T&G before it merged with Amicus to form Unite: that of relentlessly organising. Harvesting workers and raising the density of union membership in workplaces. In this approach he differs from fellow joint general secretary Derek Simpson, who has traditionally placed more of an emphasis on mergers and collaboration (the formation of transatlantic union Workers Uniting, an alliance of Unite and the US United Steelworkers, is very much his project). That’s not to say either man is right or wrong, or that their views are mutually exclusive (this blog takes no sides in the matter of Unite policy). So Woodley’s message to conference in a nutshell was: I did it my way, it’s the right way, and don’t screw up the union after I’ve gone (Woodley is due to retire at the end of next year, a year after Simpson). Several officials close to him privately expressed support for this view. He said a lot more of course, which this blog will return to. Alan Jones of PA has a good summary here.
. Several officials close to him privately expressed support for this view. Unite to challenge John Prescott for Labour treasurer? You read it here first. As Tribune reported last week, John Prescott (who incidentally is to be made a lord) is to stand for the treasurership of the Labour Party – an elected position on the party’s national executive committee which normally sees them in charge of fundraising but doesn’t make them legally in charge of accounts. But the unions are far from pleased. The view within Unite, Labour’s biggest donor, and perhaps elsewhere, is that the role belongs to the unions: the outgoing treasurer Jack Dromey was deputy general secretary of Unite, from the T&G section, his predecessor Jimmy Elsby was also a T&G official and his predecessor Margaret Prosser worked for Unison was as well. In the fag-end of my weekend off work, I heard that Unite is going to stand a candidate against Prescott, who is not thought to have consulted the brothers a great deal. This should be an interesting battle. Watch this space. P.S. Labour’s general secretary (and legal treasurer) Ray Collins, who will be in the thick of said fight, is of course a former senior official of… Unite. Update: Thanks to Tony below for pointing out Prosser worked for the T&G. Like Prescott, she has just been given a peerage. The Unite union’s first policy conference got underway in Manchester yesterday. Expect plenty of motions to be passed calling for more support for manufacturing, restoring trade union rights and taking back Labour, as the FT notes. But among one of the more contentious issues up for debate was going to be the Trident nuclear deterrent. Many Unite rank and file members (most of whom pay the political levy that funds Labour) share the views of the Labour left and centre-left about Trident, i.e. they want to cancel it. But Unite also represents thousands of workers in the aerospace and shipbuilding sectors, some of whom will build the nuclear submarines that will carry the new deterrent. So it’s unsurprising that one pro-Trident motion was last week jostling with at least five anti-Trident motions in the conference agenda. But I’m told that situation has now been resolved: the Unite executive committee will issue a statement that seeks to respect everybody’s views, thus avoiding a messy argument. Which means one less story for the likes of me. I’m delighted to say I’m going to be attending the first day of the Unite union’s policy conference in Manchester on Monday 31 May. Partly because Manchester is my favourite city in the UK, but mainly because of the opportunity to report on the future of Britain’s biggest union. Such is my ignorance of what British film directors look like that, when I sat in on Jerry Hicks’ speech at a socialist meeting in London last week, I didn’t notice the presence of Ken Loach. Ken is backing Jerry for general secretary of Unite, in a move the other candidates may not thank me for writing about. Oh well. Video here, probably not directed by Mr Loach by the looks of it. Update: I originally linked to the ‘support Les Bayliss’ page on the site of Workers Uniting Group, the Unite faction supporting him. Les has his own site, and I’ve now linked to it (above). Also, Simon Dubbins’ site is now up and running. First Labour, now Unite: Britain’s biggest union has finally agreed a timetable for electing its first single leader this year. I say “finally”; admittedly it was agreed last Thursday, but only at the very end of Unite’s three-day executive council meeting, and in a bit of a rush I hear. They’ve opted for an even longer timetable than Labour has for the leadership (see below). I mention Labour because what this means is that Labour will have a leader in place before Unite members even start voting. Candidates will have from 1 July to 5 September the end of August to nominate themselves. Ballot papers will be sent out from October, and the ballot will run to the end of the month. Curiously, though the count takes place at the end of October, the winner won’t be formally announced till 1 December. Time to allow for challenges and recounts? Who knows? Anyway, it looks as though the new Labour leader will have a fair bit of time to throw their weight behind a candidate, overtly or covertly, if they so wish*. That’s not to say nobody in Unite has thoughts about who the next Labour leader should be, of course – Derek Simpson has suggested Ed Miliband in the past, and of course Ed Balls and Charlie Whelan are close, both having worked for Gordon Brown. *If you think I’m exaggerating the effect a Labour leader could have, consider the 1995 re-election of Bill Morris as general secretary of the T&G (now part of Unite), when he beat Jack Dromey. Dromey’s perceived status as Tony Blair’s favourite candidate worked against him, and on winning Morris famously declared, “We have stopped a juggernaut in its tracks”. He meant New Labour. Update: I am told that the nomination window is actually 1 July to 31 August, not until 5 September as I originally wrote. 5 Sept is the deadline for the nomination forms to be received. Not everybody is happy. One leading participant in the election tells me: “Normal people will be scratching their heads at calling for nominations when many members will be with the kids as far from the daily grind of work as possible” – i.e. during the school holidays. So Labour decided not to have a deputy leadership contest. Or as one person present at the meeting of Labour’s national executive (which decided it on Tuesday) said: “I don’t think it’s something many people in the party give a toss about”. That view is hotly contested by NEC member Peter Kenyon (see below) and others outside the NEC and parliamentary party, but in the end it wasn’t up to them. General secretary Ray Collins insisted tho the meeting that the party rule book was with him on this issue (again, pace Kenyon). More interesting is the possibility that the decision to allow leadership hopefuls just nine days from yesterday to gather at least 34 nominations (the minimum to stand) will be overturned tomorrow at the meeting of the NEC procedures committee, as new blog Labour Uncut reports. Candidates have a window of just four days (Monday to Thursday next week) to submit those 34 names. I’m slightly irked I didn’t find this out – I knew the committee was meeting, but not that the decision might fall within their purview. Three influential MPs have already spoken out against the short nomination period – left-winger John McDonnell, backbencher and not-leadership-but-maybe-something-else candidate Jon Cruddas and Gordon Brown’s former parliamentary private secretary Jon Trickett, who told me today the decision was “deeply regrettable”. Btw, further to the post below, Liam Byrne has been in touch to say he has “no plans” to run for deputy leader. So now you know. Media interest in the Labour party’s internal election plans grows; now Paul Waugh of the Standard is weighing in (and borrowing heavily from the blog of national executive committee member Peter Kenyon by the looks of it). The key issues are: the elections for Labour’s new shadow cabinet (voted on by the parliamentary Labour party, 258 MPs) and the nature and timing of the leadership and deputy leadership election(s). The Labour NEC will tomorrow decide whether to have a) a summer leadership election or b) one which lasts till September, with the new leader announced at party conference. Let’s be clear on one thing: elections for Labour’s shadow cabinet – pace Guido Fawkes – are going to happen pretty soon, almost certainly before even an early leadership contest. Party rules say there should be one as soon as practical after a general election. So if leadership candidates want to use a shadow cabinet position as a soapbox, they’d better get canvassing. “More than a few activists are wary of any attempt to fast-track the process, as are Jon Cruddas and Ed Balls. John Prescott has weighed in and said the party should play the “long game”. Not just activists, a good deal of MPs too want to see a leadership contest that lasts till conference. And at least one union (see here). Fabian head honcho Sunder Katwala makes the reasoned case for a long contest here. Plenty of backers of David Miliband, on the other hand, want to see a leader in place by July. I can also reveal that Tony Lloyd, who as outgoing chair of the PLP was the influential linkman between Brown and the backbenches, is in favour of a quick contest. He tells me: “Let’s get the leader in situ. We’re talking about two months – that’s longer than a general election contest. If leadership contestants can’t put forward a vision of Labour’s role [in that time]… Most of us would sooner go to the conference not for coronation of a new leader but as part of a campaigning process.” There was, he said, no need to wait till September. Next week Labour’s national executive committee – which was hastily pulled together this week to discuss the coalition that never was – meets to decide the dates of the Labour leadership election, along with elections to the NEC and the national policy forum*. But what’s this? There are no plans yet to have a deputy leadership election – as Tribune reports this week. Harriet Harman told BBC Newsnight on Monday: “I’m deputy leader of the Labour Party and I’ve got no plans to step aside from that role… It’s my plan to stay deputy leader.” The NEC as a whole and Labour chiefs do not believe there is a vacancy for the position, but party rules state that nomination papers for leader and deputy leader should be sent out every year. There could be a fight. 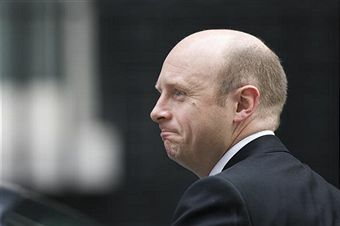 Jim Pickard at the FT reports that ex-minister Liam Byrne would like to be deputy leader “if” there’s a vacancy. Given that his close colleagues insist there isn’t, one wonders what that “if” means. Most MPs seem to disagree (including outgoing parliamentary Labour party chairman Tony Lloyd); left-winger Michael Meacher agrees. Either way, we should know in just a few days. *Which will both be conducted on a one-member-one-vote basis for the first time, following a rule change at last year’s Labour conference (as I blogged here). This admittedly anoraky change could be one nudge towards creating a Labour party that behaves in a less top-down way – at least, that’s what its proponents hope. Britian’s trade unions enter into the shining new era of Dave and Nick on an unequal footing. I’ve written many times before about the steady work of Richard Balfe, David Cameron’s (deep breath) personal envoy to the trade union and co-operative movement, who has done the rounds of almost every single union, Labour-affiliated or otherwise. Unite, ineviably, said no*, as did shopworkers’ union USDAW and construction union UCATT. The last two will have a lot of dealings with new Business Secretary Vince Cable (of whom more very soon) and Work and Pensions Secretary Iain Duncan Smith: IDS’ department is in charge of the Health and Safety Executive and BIS gets called on when companies like Woolworths start going to the wall. However, this is about a lot more than whether ministers know abot the unions’ point of view and their shopping lists. In the public sector, a great many negotiating bodies exist to thrash out pay negotiations and much more. 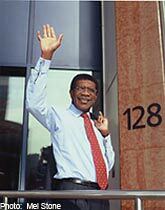 Unison, GMB and Unite, for example, head up the trade union side of the national joint council for local government. Every year they meet the employers’ wing of the Local Government Association and together they fail to agree a pay deal for that year. Other such negotiating boards and teams exist across central government and quangos, from HM Revenue and Customs to the Meat Hygiene Inspectorate. Some unions have been busily ensuring that the Tories know of these union negotiators and who they are, in spite of their differences. Let’s just say that new Health Secretary Andrew Lansley and his ministers will probably know a lot of union officials by now. So it looks like some unions will be on the front foot now, and others not. Whether that helps them get what they want is of course another matter entirely. *or at least the former T&G section did – I was never sure whether or not there’d been meetings with people from the Amicus side. Not that Derek Simpson is remotely Tory-friendly, mind you; he isn’t. Maybe he wasn’t told. Looking for my new blog? I have been the staff reporter of Tribune magazine since June 2007, writing news stories about politics and the labour movement. This blog feeds off my work for Tribune and is meant to be a politically impartial 'long view' analysis of topical issues - with what little inside information I can muster. All views are my own and not Tribune's. I am not a member or supporter of any political party. In a previous life I was a forward planner and before then launched The Cheese Grater magazine at University College London, voted small budget publication of the year at the Guardian Student Media Awards. You can contact me at rene dot lavanchy at googlemail dot com.